New Jersey’s impressive coastline and considerable shipping industry means the need for workers like forklift operators is stronger than ever. If hire forklift operators in New Jersey, or you’re an employer who needs qualified workers for top notch efficiency and fine protection, you need forklift certification NJ from ForkliftCertification.com. 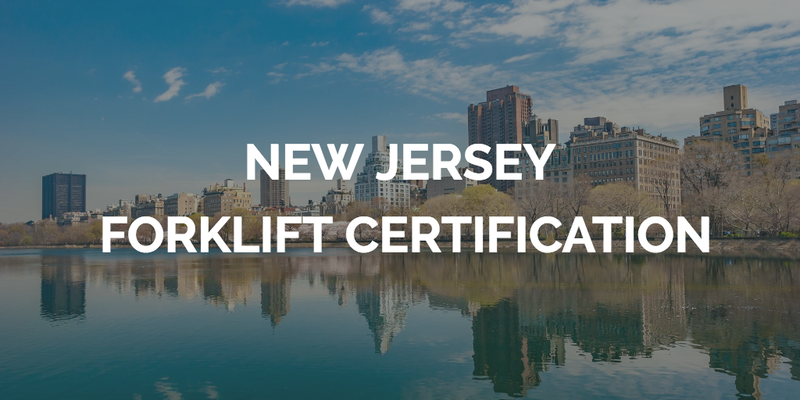 Our training courses (Train the Trainer, Training Kit, Bundle Package) make forklift certification in New Jersey more convenient, accessible and easier than ever. You’ve probably heard that forklift training in New Jersey is difficult, expensive and frustrating. With ForkliftCertification.com, we bring affordable, on-point forklift certification in New Jersey directly to your employees. And with our free recertification training and lifetime support, there’s simply no better option for your forklift training in New Jersey. Sign up today and experience the best forklift certification in New Jersey! Why Do I Need Forklift Certification NJ? Forklifts are common pieces of equipment used in warehouses, stores, and outdoors in many different types of settings. However, they can be dangerous and cause serious accidents. Common accidents involved with forklifts are tip overs, collisions, workers being crushed against the equipment, and falling objects that have been disturbed or improperly stacked. Forklift certification in New Jersey teaches workers everything they need to know to not only operate forklifts properly but protect their lives on the job. Employers are required to provide forklift training in New Jersey for their employees. OSHA requires that all operators be trained and certified, and employers must prove their training with the proper paperwork. ForkliftCertification.com offers fast & easy New Jersey forklift certification and forklift licenses in New Jersey. What Types of Industries Hire Forklift Operators in NJ? New Jersey is known as the crossroads of the east, and is home to bustling manufacturing and distribution centers. Forklifts are most often used in warehouses and retail spaces to act as an integral component of distribution efforts. New Jersey also plays an important role in the biopharmaceuticals industry, manufacturing about one-sixth of the country’s pharmaceuticals. New Jersey’s other top industries are technology and healthcare. A few of the top employers in New Jersey who hire trained forklift operators include Merck, a pharmaceutical company, Johnson & Johnson, Nestle, and Campbell Soup. There’s virtually no shortage of jobs in New Jersey for qualified forklift operators with a forklift certification NJ. You need to know the right type of training program to put you in the best position possible and receive your forklift license NJ. It’s very important to look for an OSHA-compliant training course because it’s the only one that will ensure you learn everything you need to know to operate forklifts safely, have only the most up-to-date information, and ensure you can protect your employer against fines. Luckily for you, FLC has created programs that cover all of the requirements for forklift training. All you’ll need to do is complete the evaluation at your workplace with a qualified trainer, which we also provide training for. if you’re an employer who needs solid credentials and training for your workforce, you need to know how to get a forklift license in NJ from the best source possible. Look no further than ForkliftCertification.com. We’ve made it easy and affordable to complete OSHA-compliant forklift training, all from the comfort of home on any device with an internet connection. Workers don’t have to travel to an offsite facility to learn about forklift training in New Jersey, because ForkliftCertification.com offers the ultimate in online convenience. The Training Kit costs only $299 for all three classes. Each comes with English and Spanish options and free three-year renewals for life, and each qualifies you for your forklift license NJ. This is one of our most popular New Jersey forklift certification packages. Need convenient, comprehensive forklift training in New Jersey? Our Train A Trainer course teaches experienced personnel how to lead the forklift evaluations for new operators in order to qualify them to receive their certification. If your forklift certification in New Jersey aims to create in-house Certified Forklift Safety Experts, this is the course for you! And our Bundle Package combines both the training kit and Trainer course to save employers more money on getting the training their operators need and keeping it in-house to save loads of hassle and dollars. No other New Jersey forklift certification package offers an equal amount of value and comprehensive instruction! If your company needs a more complete solution to compliance gaps, register for our forklift training in New Jersey today! Look into our training kit today and hold your NJ forklift certification in your hands in only a couple of hours! For questions about our forklift certification in New Jersey, please call our OSHA compliance experts at (888) 278-8896). Thanks for considering ForkliftCertification.com your #1 option for New Jersey forklift training!